One of the longest continuous committed relationships in my life is the one I have with my Bible. I love my Scofield I bought when I was fifteen. It was my first “big purchase” of my short life. I had to save my meager allowance and little baby-sitting funds for months to pay for the long-coveted reference Bible, just like the one each of my parents owned. I still remember the day I proudly walked into the Bible bookstore and plunked down my wrinkled bills and ordered my burgundy volume. I shyly requested they imprint my name on it, too. It was the beginning of a long and wonderful relationship. I carried that Bible every Sunday and Wednesday to church. I took careful notes in that Bible during revival meetings with great and interesting preachers. I lugged that Bible to class and chapel at Bible School and added to my margins, noting the areas that some teachers disagreed and others reinforced my theology. 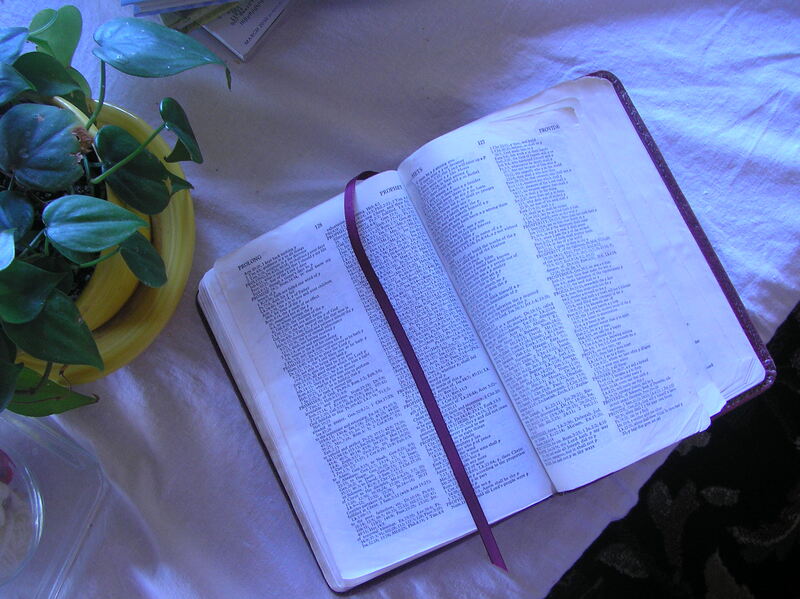 I used that Bible during my early twenties to question my faith, then my convictions, then set my standards. I wrote dates and places next to verses when the Lord tried my commitment to Him. There are tear stains on some pages. In the front pages, I have recorded the salvation and baptism of my first three children. Several family deaths are recorded in a special record, too. I have written in the front and back fly sermon notes that have changed my life. Some of the pastors who preached those sermons are no longer in the ministry. But the Bible still stands. 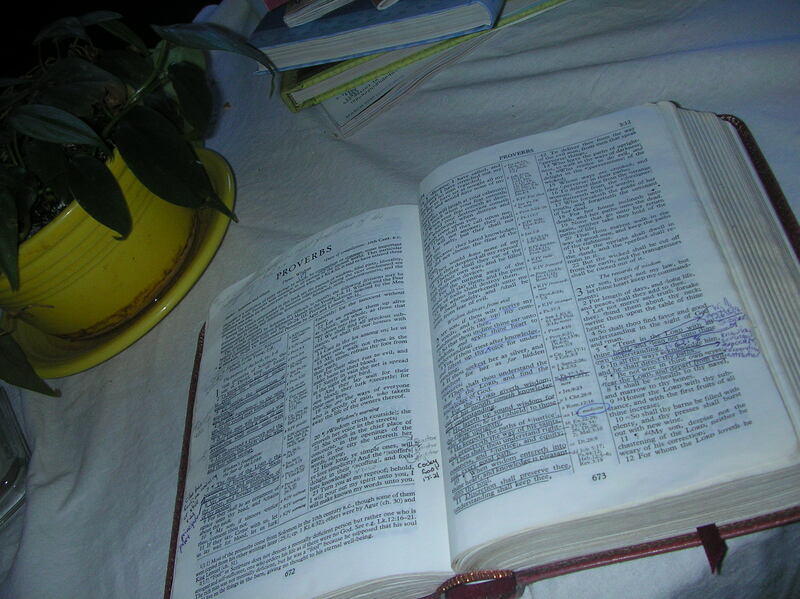 My copy of God’s Word was falling apart, and my husband offered many times to buy me a new one. But I can’t bear to part with the landmarks God has given me in this particular Book. I fear lest I forget what He taught me therein. So, for my birthday, I asked if I could have it repaired. And after several months at The Book Doctor, my Bible is back home with me at last! I was able to keep the original cover; it was cleaned and shined. I can still see my original maiden name stamped faintly. The binding and ribbon were completely replaced and torn pages were carefully inserted with a velum-like overlay. I don’t know how they did it (David took my Bible and returned it to me), but I am VERY impressed! Having my Bible restored cost about the same as buying a new leather study Bible. But the value of keeping my treasured Word with me to guide me for decades to come is priceless! That is a beautiful story, my friend. What a blessing to be able to look back and see how the Lord has led you in your walk with Him; the lessons learned, the pain borne, the refining experienced. A blessing indeed. I am happy for you! Thanks for sharing it. Thanks for sharing this! 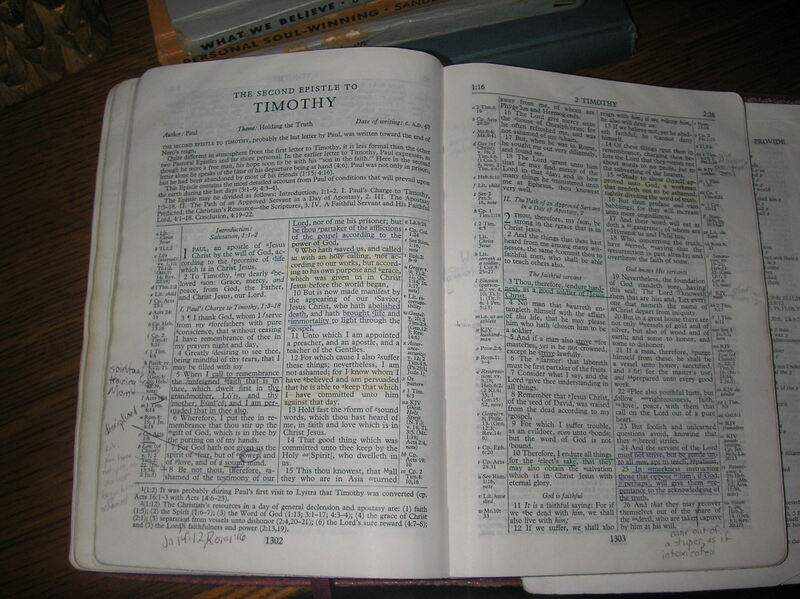 My Bible looks just like your “old one” —- broken and full of personal notes with lots of favorite passage and verses underlined many times over. Mark told me to have it repaired, but I just feel so lost without it. ( I’m one of those who can not read another Bible; can’t find my way around another Bible). But after reading your blog, I think I’ll just have to “let go” and have it repaired– soon. Thanks, Lea for being such an encouragement. Thank you! I was hoping you would show your before and after pics of your Bible. I totally understand why you would do this, the memories of a lifetime of Bible reading/jotting notes/crying tears/etc are too valuable to replace! You must have loved having it back in your hands again. Yes, I was sick all weekend. It went completely through the family. David has it now, poor thing! Next PostWhere Should the Pilgrims Go?